The Cross contract which operates on multiple inputs and builds a distributed Cartesian product over its input sets. The CoGroup contract partitions each of its multiple inputs along the key. Independent subsets are built by combining equal keys of all inputs. The Match contract operates on multiple inputs. It matches key/value pairs from all input data sets with the same key (equivalent to the inner join operation). The Same-Key contract where each key/value pair that is generated by the function has the same key as the key/value pair(s) from which it was generated. This means the function will preserve any partitioning and order property on the keys. The Super-Key where each key/value pair that is generated by the function has a superkey of the key/value pair(s) from which it was generated. This means the function will preserve a partitioning and partial order on the keys. The Unique-Key where each key/value pair that is produced has a unique key. The key must be unique across all parallel instances. Any produced data is therefore partitioned and grouped by the key. cally that a partitioning by the keys is given, but there is no order inside the partitions. erent cost-based optimization techniques. In particular, the optimizer generates a set of candidate execution plans in a bottomup fashion (starting from the data sources) where the more expensive plans are pruned using a set of interesting properties for the operators. These properties are also used to spare plans from pruning that come with an additional property that may amortize their cost overhead later. 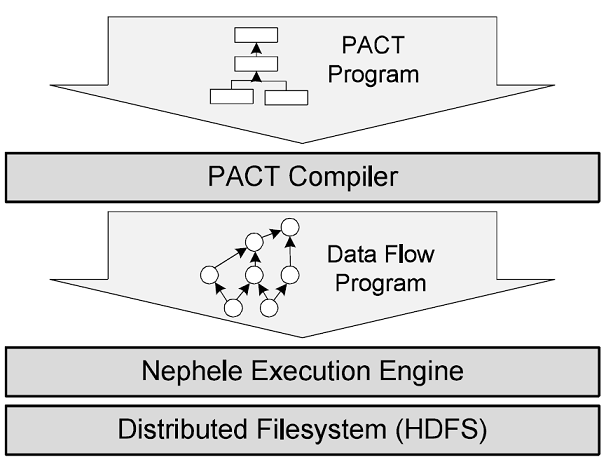 ne custom packages, the respective operators and their instantiations. Meteor's syntax is operator-oriented and uses a Json-like data model to support applications that analyze semi- and unstructured data. Meteor queries are then translated into data ow programs of operator instantiations which represent concrete implementations of the involved Sopremo operators. A main advantage of this approach is that the operator's semantics can be accessed at compile time and potentially be used for data ow optimization, or for detecting syntactically correct, but semantically erroneous queries.